Lexus CT200h's class leading emissions | What Car? 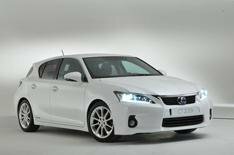 The new CT200h hybrid small family hatch will have the lowest emissions in its class, Lexus has confirmed. Its 96g/km CO2 emissions put it ahead of all its most obvious rivals. Neither the BMW 1 Series nor Mercedes CLC ranges has a single model with sub-100g/km CO2 emissions; and, although there are versions of the Audi A3, VW Golf and Volvo C30 with similar emissions, they all put out 99g/km. Perhaps the most crucial difference is that, while these rivals are diesel-engined, the new Lexus has a petrol-electric hybrid powertrain, which it shares with the Toyota Prius. This, says Lexus, gives near-zero levels of NOx and particulate emissions. The result of these low figures is that annual road tax for the car will be free, and it will incur company car tax at the lowest 10% rate. Its average economy, meanwhile, is 68.9mpg. However, that is a little less than the 74.3mpg returned by DRIVe versions of the Volvo C30 and the VW Golf Bluemotion. Despite the cars impressive green credentials, Lexus wont be marketing it as a purely environmental choice. Instead, the company is making great claims about how rewarding the CT200h will be to drive. Lexus has already announced that the hybrid powertrain will have four settings, including Sport, which they say gives the car a more engaging drive. After appearing at the Paris motor show at the end of the month, the CT200h will be available to order from October. At the same time, Lexus will confirm the cars price which we expect to start from around 22,000, and the first customers will take delivery of their cars in early 2011.